I don't usually post too much personal stuff on here. It's not that I don't mind sharing, I love letting people in and letting them get to know me! I just like to keep this for what it is, a book blog. I tried having a personal blog, but at the moment, 2 blogs were just too much to manage at the time. For those of you that are regulars here, you may know that I am a big animal/dog lover. Owning 3 dogs myself, and running my own dog spa. I treat my dogs like my children. Unfortunately, early this morning, one of my beloved dogs passed away this morning. She was still young (at least in my book) She would have been 10 in October. She had been sick for the last 3 weeks, and sadly succumbed to her illness. 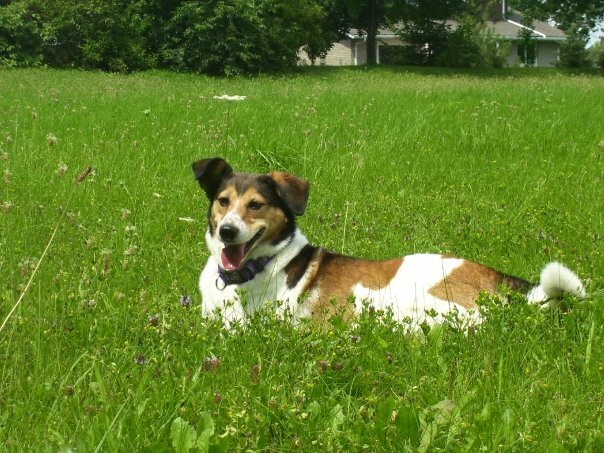 She was our little nervous Nellie, always keeping us (and her 2 four legged brothers) on our toes. She was fiercely loyal and had one of the most lovely souls. I will miss her being curled up at my feet or beside me while I'm devouring a book, she was a great sidekick! Thank you to my readers and followers for allowing me to use this time to devote to Webster. She was one fantastic pooch! So sorry --- I can relate to your pain since I've been through this myself. I'm so so sorry :( Dogs are such amazing companions and it hurts like crazy when they leave us. I am SO SO sorry for your loss - my husband and I just lost one of our canine kids last week, and it's a terrible feeling. Mental hugs. My heart breaks for you. My two dogs are around 13 now, and I'm noticing that neither of them seem too healthy these days. They are with us for such a short time.